When you are self-employed, you generally have to have a certain personality trait which means you can motivate yourself to get to work. You don’t have a boss who tells you what time you need to start or shout at you for being lazy, it’s all on you. That being said, us creative business owners can have those ‘meh’ days when everything seems like a huge effort. I recently had a day like this when first thing in the morning I received a big of bad news from a client. This happens time to time and usually I am quite good at dealing with work related matters but this one unfortunately knocked me back and after that, I just couldn’t concentrate. Hey, sometimes I just wake up on the wrong side of bed or forget my morning coffee and then the day seems a bit like a write off. But on days like this, I still want to get as much done as possible. So how can I do this? 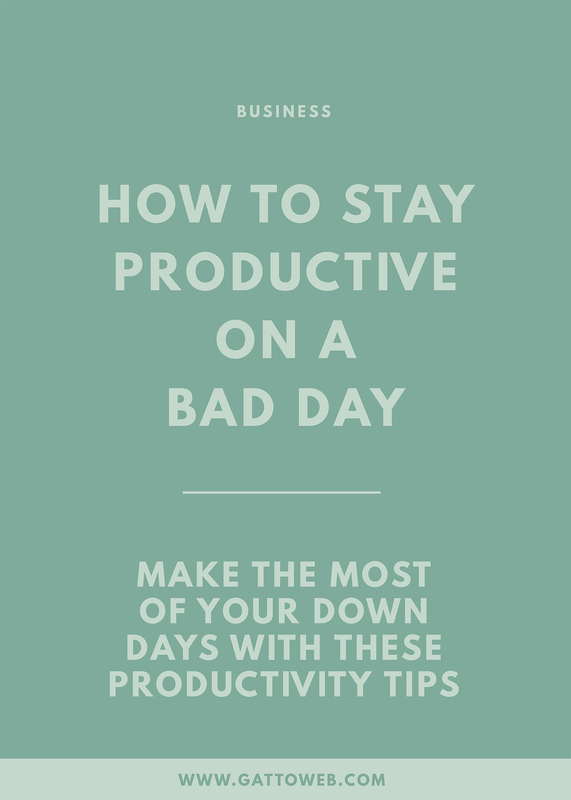 I have a few tips on how to make the most of a bad day. Ok so you know today is not going to be your best. So, don’t put more pressure on yourself by giving yourself a huge workload that you ‘have’ to do. Cut down your tasks to be a bit more manageable and then you won’t be as disappointed if you don’t get everything done. Everyone has some smaller, more doable tasks on their to do list which can be ticked off with not too much effort. Try to focus on these first as these will be easier to deal with and not take much brain power. Think sending emails, scheduling social media, spell checking your blog posts, the things which need to be done but aren’t going to test you too much! If you have deadlines or tasks related to your clients which you absolutely have to complete such as answering your emails, sending files or completing a design, make sure you get these done, even if it’s the only thing you do. You don’t want one bad day to make you look unprofessional or like you don’t care about your clients. Once this is out of the way, feel free to curl up in front on Netflix! Try to work on projects which you love doing the work for. This will give you a bit more of a boost to get to your desk and back in front of a laptop. If I need a bit of motivation whilst working, I’ll do a little bit of work on a personal project or client work which I love working on and that usually helps me move on with things I’m not too keen on doing. If I feel like work is an absolute no go on a particular day, I will try and plan for the rest of the week instead. Rearrange your to do’s to different days and make sure you can fit your work in the rest of the week and you will feel less guilty about your mood getting in the way. Get your bullet journal, your calendar or your project management tool out and get planning! You’ll feel like you have done some work and will feel prepared for the rest of the week ahead. Sometimes, there’s just nothing we can do to get ourselves out of a ‘bad day’ mood so don’t feel bad about giving yourself the rest of the day off. It is one of the perks of running your own business! Put work to the back of your mind and relax. You will wake up the next day feeling refreshed and motivated to get back to what you do best! What do you do if you are having a bad day? Are you a push through or get back to bed kinda person? Let me know!